Utility Services Associates, and a sister company Fluid Research Centre got their start in 1993 with the down sizing incentives being offered to employees of Ontario Hydro. About 4,900 took either voluntary separation or early retirement. Ken J. Brown, the principal of these businesses, was of those taking voluntary separation after being at OH for 17 years. Plus having previously worked on lubrication and wear the opportunity was used to offer services that had not previously been readily available to other utilities. First, Ontario Hydro in spite of its name was one of the larger operators of both nuclear and thermal plants. Total assets were about $40 billion, annual revenue about $6 billion and installed capacity 28 GW. 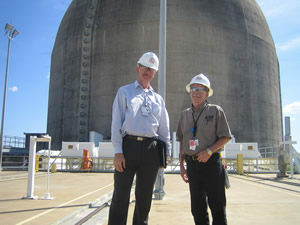 On the nuclear side there were 20 reactors in operation with the eight 900 MW units at Bruce on Georgian Bay being the largest. For the thermal stations, these were mainly coal fired although there is a large oil fired station which is soon to be on natural gas. The largest coal fired station has eight 500 MW turbines at Nanticoke GS on Lake Erie. In addition, there are also hydroelectric stations ranging from single turbines that have been in operation for almost a hundred years, to new multi-turbine stations being built. This is being mentioned as this company and now companies, was different than most because it designed and built the stations. Plus, it had a very large research facility that supported the operation of these units. The advantage of this was that it permitted a very wide range of experiences and information to be obtained in a very short period of time. Activities ranged from designing, writing/reviewing specifications, tender reviews, commissioning and day to day operation of the stations. Also, this is not restricted to any one station or type of equipment and included visits to almost all the nuclear and thermal stations as well as many of the large hydraulic stations. Received a BASc (73) and a MASc (76) in Mechanical Engineering from the University of Waterloo in Ontario, Canada. Emphasis was on materials and design courses. Also had the opportunity to play varsity rugby and hockey for the Faculty of Engineering team. Waterloo is fairly unique because it has a co-operative program and work terms were spent in both manufacturing plants and mining facilities. This included hands on experience making mufflers using presses, QA work with Goodyear tires and four work terms with Texas Gulf at their Northern Ontario ore concentrator and zinc plant. The mining company work included one term in the machine shop, one as a pipe fitter and two in the Engineering drafting office. The 4th year project at Waterloo was on the lubrication of wire in a Waterbury double blow cold hearing machine and graduate work was on the design, construction and operation of a test rig to study impact and sliding wear of Zircalloy-4. This is a nuclear reactor material with the work funded by AECL. In 1976 Ken joined the Power Equipment Department of the Design and Construction Division of Ontario Hydro and in 1993 was a Senior Design Specialist in the Equipment & Rotating Machines Section, Engineering Analysis Department, Nuclear Technology Services, Ontario Hydro Nuclear. Assistance was provided to the Corporation on tribological aspects of equipment for nuclear, fossil and hydraulic power station. This covers operation, failure investigations, maintenance procedures and design aspects for lubricants, fire resistant fluids, lubrication, bearings and wear for all equipment. Specific equipment varies from nuclear motors, steam and gas turbines to mini-hydro stations and wind turbines. Responsibilities also included being the improvement facilitator for the Department which involved training by 3M and Ontario Hydro, providing training to others and being part of the improvement process. Chairperson of an NRC-ACOT/STLE Committee organizing a “Hydraulics & Robotics” seminar, Sir Sanford Fleming Building, May 28-29, 1985, Toronto, ON. Member STLE Board of Directors from 1983-1988 with specific responsibilities Director/Sponsor for the Editorial and Publications Committee and then for the Technical Committees and Industry Councils. Currently assisting the Toronto Section as a Publicity Chair and on the 2004 Local Arrangements Committee. Has given numerous presentations and papers to STLE and others. In 1993 was elected as a Fellow of the STLE, the first Canadian to be so honoured and in 2004 was awarded the STLE’s highest honour, the P.M. Ku Meritorious Award, for service to the STLE.